I was a little bit blown away by Moon. Truth is I was expecting to be disappointed and when the big reveal comes early I was worried that it was going to let me down. That it doesn't is a testament to director Duncan Jones (Zowie Bowie, yes seriously) and Sam Rockwell on whom so much of the film hangs. The story is set at some point in the future and a vast resource of energy has been discovered on the Moon. Sam, played by Rockwell, is coming to the end of a three year stint as the sole employee of a base on the far side of the Moon. He looks after the robotic mining trucks that scour the surface and has just a robot called GERTY, voiced by Kevin Spacey, for company. Messages home are disjointed due to a technical glitch that means no live feed is possible and the sense of isolation is nicely done, the base is a 2001 style homage, all white and vaguely creepy. Sam starts to see things, visions of others, and at first you suspect this is his mind unwinding after so long alone, but pretty quickly you realise that there's much more at stake here than his sanity. Rockwell delivers a stunning performance, in a movie that rests almost entirely on a believable portrayal of a man slowly falling apart, Sam's confusion and eventual acceptance of his world is beautifully conveyed. Spacey's voice is another throw back to 2001's HAL however there's a lovely pay off to this robots story line, it's almost worth watching the movie for the moment a robot arm appears over Sam's shoulder to punch in a password on a computer keyboard. As touching as any robot has ever been in a movie. The BluRay looks stunning with none of the visuals suffering from the 'HD effect' where CGI can end up looking cartoon like. 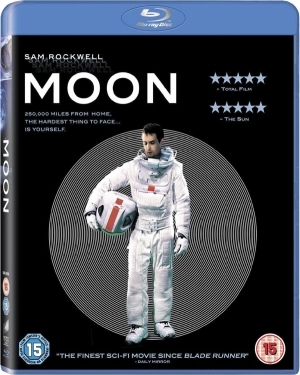 Although much of the film takes place inside the base on a real set, during the moments outside, on the Moon's surface, the rendered craters and dust look gorgeous and are shot through with emotional clout by the end. It's a weird, almost small film and maybe the reveal comes too early but don't let that you put you off, it's not a twist movie after all. It's way better than that. It's a film about what it is to be human. I'm pretty sure I just got through that without any spoilers. Yay me! A couple of spelling mistakes but you have made me want to watch this. I shall put it on my LoveFilm list now.